Ayiti - Èske yon pwogram miltileng pral solisyone vrè pwoblèm lekòl Ayiti ? solisyone vrè pwoblèm lekòl Ayiti ? 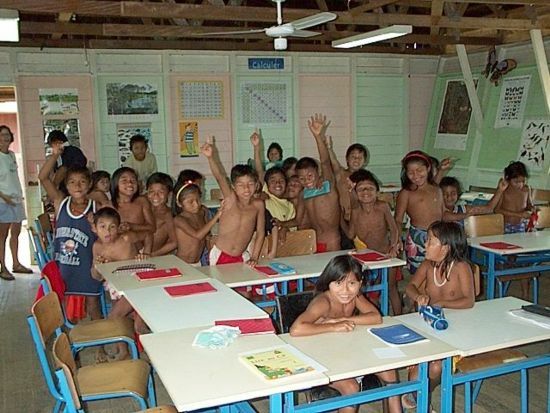 Ecole de village amérindien, Camopi, Guyane. Source. Mwen ta di «di ak fè» se de (bagay diferan). Nou DWE, premyèman, solisyone pwoblèm ki an rapò ak kesyon DIGLOSI e BILENGWIS an Ayiti epi itilize fowòm ayisyen sou entènèt la kòm mwayen pou diskite kesyon sa yo. Pou fè sa, yon bonjan plan POLISI LENGWISTIK nes esè pou gouvènman an ta vin avè l (nenpòt lè yon vrè gouvènmen ta monte sou pouvwa). Ki lang ou panse timoun nan peyi JAPON aprann (li ak ekri) avan yo kòmanse klas 8tyèm (nivo mwayen)? Sètènman, repons lan se JAPONÈ. Yo kòmanse anglè nan 8tyèm (menm jan ak lekòl nan peyi Eskandinav yo byenke pifò elèv nan peyi Ewòp Dinò sa yo gen yon pi bèl metriz lang anglè a si n ap konpare ak elèv japonè, akoz Metodoloji Lengwistik Aplike ki itilize nan peyi sa yo. Mwen kòmanse aprann espayòl pou kont mwen lè m te gen dizan an Ayiti (kote m te itilize metòd Sans Peine ASSIMIL yo); sa vle di, li t ap yon bèl ide pou paran espoze pitit yo a lòt lang pandan yo trè jèn, epi vwayaje nan lòt peyi ak yo (si l posib e lè l posib). Enterè m nan lang Cervantes la te pi pwofon ke enterè m nan lang Shakespeare la, men apre anviwon prèske 3 deseni (trantan) depi m ap viv Ezetazini epi vwayaje an Ewòp, anglè vin tounen tankou dezyèm lang mwen byenke mwen toujou metrize lang espayòl la. Nenpòt moun ki gen chans li liv mwen an ki rele Yon koudèy sou pwoblèm lekòl Ayiti pral wè fokis mwen nan esè sa yo pa sou itilizasyon lang nan lekòl Ayiti tankou kèk otè ayisyen komik ta fè sa oubyen kèk entelektyèl sou rejim Duvalier a (kote yo ta rann kreyòl ak fransè responsab pou to alnalfabèt ki grenpe lesyèl nan peyi a olye pou yo ta santre vrè pwoblèm nan ki gen pou wè ak «politik»), kote yo eseye divòse yo de Reyalite Ayisyèn nan men sa k pi enpòtan an, se pito opòtinite pou ti Ayisyen ta genyen pou ale lekòl. Timoun sa yo byen entelijan (si n ap gade kèk nan pèfòmans yo), kèlkeswa lang yo ta vle itilize nan lekòl Ayiti, sa p ap yon gwo pwoblèm pou yo osilontan yo gen opòtinite ale lekòl. Vrèvanvre, sa nou dwe batay pou li a (pa ak zam) se leve vwa nou pou gen lekòl gratis (enkli materyèl) ak manje. Rechèch demontre ke pifò nan timoun Ayiti k al lekòl pa rive konplete menm sik mwayen an akoz sitiyasyon ekonomik peyi a: pa gen lekòl gratis, paran timoun k ap bat dlo pou fè bè pou voye yo lekòl pa kapab achte liv ak manje pou yo byenke yo fè sakrifis achte omwen yon inifòm, ke l se yon «lavam metam wetam» yo mete sou yo chak jou. LEKÒL GRATIS pa dwe konsidere kòm yon «kado» ke gouvènman ayisyen an ta bay timoun sa yo, men pito se yon pwovizyon ki kouvri anba Konstitisyon 1987 la. Bagay sa yo (dwa legal), yo dwe pale sou yo nan radyo ak televizyon an Ayiti pou edike popilasyon an e nan fason, sa pral eradike maladi ki rele «analfabetis» la. Si timoun sa yo, an Ayiti jodiya, ap trennen nan lari, antre nan gang, tounen vagabon, dilè dwòg, dwòg adikte ak mandyan, se pa fòt yo men pito fòt gouvènman an ki pa fè travay konstitisyonèl li. Sa se vrè SIVIK (ki pou ta anseye), e nou menm Ayisyen, nou dwe fè yon bagay ak sa, yon fason yon lòt (ann eseye fè travay nou kòm sitwayen, ann eseye aktif nan ede Ayiti ale vè lavan, ann eseye yon aktivis pou yon pi bon Ayiti, renmen Ayiti pa ta dwe sèlman yon pawòl k ap soti nan bouch Ayisyen men ann montre sa pito pa aksyon nou). Pou retounen a Japon (ki dwe youn nan sous enspirasyon pou Ayisyen ki ta vle wè vrè devlopman fèt Ayiti), nou te ka poze kesyon sa a: Konbyen peyi nan lemomm ki pale JAPONÈ? Repons lan se: YOUN. M ap li kòmantè komik sou kreyòl depi plis pase 30 ane tèlke li se «yon lang izole», vrè radòt ki soti nan bouch «swadizan» Ayisyen save ki rive lwen lekòl. Li si komik pou wè a ki nivo mantalite a kolonize. Kèk menm ale pi lwen toujou pou di «kreyòl pa yon lang»; donk si l pa yon lang, yo pa moun paske chak moun pale yon lang matènèl; nan yon fason, yo mete tèt yon an klasifikasyon omosapyen ki pi ba (pase moun) lefèt ke yo panse konsa. Donk, edikasyon dwe fèt nan tout nivo pou refè mantalite kolonyal la oubyen pou mete vi ak sèl nan brenn ki zonbifye yo. Pakonsekan, lang matènèl la dwe jwe yon gran wòl nan lekòl yo. Epitou, nan peyi devlope yon an lemonn ak nan kèk peyi tyèmond (e.g., USA, Kanada, Lachin, Larisi, Frans, Lasuis (depan de kanton an), Almay, Itali, Japon, Kiba, Meksik, Brezil…), lang natifnatal la se li menm tou ki lang ofisyèl ki itilize lekòl. Sitiyasyon lang an Ayiti diferan de kèk kèk peyi Afriken kote pa egzanp nan peyi kouwè Kotdivwa, Nijerya, Senegal… (jis pou site kèk) yo pale plis pase 50 lang (ki reprezante diferan gwoup etnik, pakonsekan yo bezwen yon lang nasyonal (ke l se fransè ou anglè) ki an menm tan itilize kòm «La langue véhiculaire et la langue des registres» ki konekte tout moun tou, epi sèvi kòm «lang ofisyèl». An Giyàn Fransèz (kote m vizite), gen anviwon 11 lang ki pale la; kòm «department d'outre-mer», lang fransè a se li ki lang nasyonal. Nan ka Ayiti, tout Ayisyen pale kreyòl kòm lang natifnatal yo (pa gen pwoblèm menm pou kominike paske se yon gwoup etnik omojèn), donk li dwe jwe tou yon wòl enpòtan nan edikasyon (kòm premye lang) avan metriz nenpòt lòt epi pou montre respè pou kilti ayisyèn nan paske lang, an jeneral, se yon koze ki trè sansib e se youn nan engredyan kiltirèl ke yo dwe manyen ak anpil swen. Gouvènman Ayisyen dwe kòmanse valorize lang matènèl tout Ayisyen, epi itilize l nan pale kou nan ekri. SIY (tout kote) dwe ni an fransè ni nan kreyòl. Mwen pa t ap gen oken pwoblèm ede ak tradiksyon sa yo GRATIS TI CHERI si yon gwoup Ayisyen ta vle ede nan sans sa a oubyen anbake yo nan fè kèk bagay pozitif ki ta kapab ede nan sans sa a.
Pou moun k ap viv Kanada, gen yon lwa nan pwovens Kebèk ki rele «La Loi 101», ki di li obligatwa pou poste an fransè. Nan ane 70 yo, lè m te kòmanse vizite Kebèk pou premye fwa, tout bagay te BILENG (an fransè kou an anglè), kounyeya tout siy yo an fransè. Dwe gen tout yon kanpay pou epole ‘bilengwis' an Ayiti. Ou pa ka janbe de yon premye lang a yon dezyèm epi a yon twazyèm, a yon katriyèm san metrize youn nan sa avan yo (ki ofisyèlman rekonèt nan konstitisyon peyi a); se jis yon konsèy pou lekòl an jeneral men lakay, se ta yon bèl ide si paran te kapab espoze timoun a plis ke youn, e an Ayiti nou konnen deja se sèlman paran ki kapab ki pral gen opòtinite fè sa amwenke gouvènman an panse a pwogram radio ak televizyon kote ta gen televizyon nan tout lari dekwa pou timoun ki pa gen aksè ak sa lakay yo ta gen chans gade kèk pwogram timoun epi mwen gen anpil dout se yon bagay ki pral fèt akoz lajan sa ta koute, e nou ta ka menm mande konbyen tan l ap pran gouvènman ayisyen pou solisyone yon senp pwoblèm elektrisite lè Ayiti te ka itilize enèji solè (24 sou 24), yon bagay ki pa ta koute chè ditou epi ki ta nan avantay tout peyi a. Jiska yon lòt lè ankò, ann kontinye viv nan ILIZYON (an tèm rèv nou pou yon bèl Ayiti) men pataje bèl ide n yo ak lòt moun. Haiti 's schools real problems ? I would say it's one to say and the other to perform, paraphrasing from an English saying. We MUST, first, solve problems related to DIGLOSSIA and BILINGUALISM issues in Haiti and use on-line Haitian forums as a means to discuss these issues. In order to do that, a strong LINGUISTIC POLICY is needed to be drafted by the government (when ever a real one would ascend to power in Haiti). What language do we think kids in JAPAN learn (to read and write) before reaching 8th grade? The answer is of course, JAPANESE. They start English in 8th grade (same as schools in the Scandinavian countries though most students in these northern European countries have a better command of the English language comparing to Japanese students, due to their Applied Linguistic Methodology). I started learning Spanish by myself when I was ten years old in Haiti (by using the ASSIMIL Sans Peine methods); that means, it would be quite a good idea for parents to expose their children to other languages at a very young age, and to travel to other countries with them (if possible or when is possible). My interest in the Cervantes language was stronger than that of the Shakespearian one, but after almost three decades living in USA and traveling to Europe, English is likely to be my second language though I still have a fluency in Spanish. Anyone who has a chance reading my book entitled Yon koudèy sou pwoblèm lekòl Ayiti. (“A look at the problem of schools in Haiti”) will see that my focus on these essays are not on language use in Haiti's schools as some funny Haitians writers or scholars under the Duvalier's regime have put it (making Creole and French responsible for the high illiteracy rate instead of tackling the real issue which has always been “Politics”), trying to divorce themselves from the Haitian Reality but rather opportunities that Haitian kids have to attend schools. They (our kids) are quite smart (by looking at some of their performance), whatever language they want to have in schools in Haiti, that won't be a big deal for them as long as they have the opportunity to attend school. What we do really need to fight for (not with guns) is voicing for free schools (including school materials) and lunch. Research shows that most kids in Haiti who are attending school would drop out before even completing the middle school circle due to the country's economic situation: no free schools, those students whose parents are making ends meet to send them to schools can't afford buying them books and food for them despite of their sacrifices buying them at least one uniform, be it a “lavam metam wetam” that they wear every day. FREE SCHOOLS should not be regarded as a “gift” that the Haitian government would give these kids, but rather as a provision covered under the 1987 Constitution. These things (legal rights) must be talk on radios and TV's in Haiti to educate the population and in a way, will help eradicating the disease called “illiteracy”. If these children, in Haiti today, are hanging out in the streets, joining gangs, becoming vagabonds, drug dealers, drug addicts and beggars, it is not their fault but rather the government's for not doing their constitutional job. This is real CIVICS (to be taught), and we Haitians must do something about it, one way or another (let's try to do our jobs also as citizen, let's be active in helping moving Haiti forward, let's be an activist for a better Haiti, loving Haiti should not only be a word that comes out of Haitians' mouth but rather, let our actions talk). Going back to Japan (which should be one of the sources of inspiration for Haitians who would like to see real developments taking place in Haiti), we may ask this question: How many countries in the world speak JAPANESE? The answer is: ONE. I have been reading funny comments about Creole as an “isolated language” for over 30 years, real silly things uttered by “so-called” Haitians scholars who went far in school. It's so funny to see to see to what extent their brain has been colonized. Some even went further saying that “Creole is not a language”; if so, then they are not humans because every single human being speaks a native language; in a way, they put themselves in the classification of lower primates by reasoning that way. So, education must be done at all levels to reshape the colonial mind or to revitalize the zombified brains with salt. Therefore, the native language should play a great role in schools. Also, in the developing countries around the world and in some third world countries (e.g., USA, Canada, China, Russia, France, Switzerland (depending on the area), Germany, Italy, Japan, Cuba, Mexico, Brazil…), the native language is also the official language used in school. The language situation in Haiti is different from the one in some African countries where for instance in Ivory Coast, Nigeria, Senegal … (just to name a few) more than 50 languages (representing different ethnic groups) are spoken, therefore a national language is needed (be it French or English) which is at the same time “La langue véhiculaire et la langue des registres” is used to connect everyone, and is also used as “official language”. In French Guyana (where I've been), there are about 11 languages spoken there; as a “department d'outre-mer” (over-seas department), French is used as the national language. In the case of Haiti, all Haitians speak Creole as their native language (no problem at all in terms of communication, a homogeneous ethnic group), therefore it should also play a great role in education (as the primary language) before mastering any other and by showing respect for the Haitian culture since language, in general, is a very sensitive issue and an important cultural ingredient that must be handled with care. The Haitian Government must start valorizing the native language of all Haitians, and use it both in speaking and writing. SIGNS must be in both French and Creole. I would not have any problem at all helping with these translations FREE OF CHARGE if any group of Haitians would like to do some works that would help in this sense or embarking on doing something positive that could help in that sense. For those who have been living in Canada, there is a law in Quebec entitled “La Loi 101”, making it mandatory to post in French. In the late 70's when I was visiting Quebec for the very first time, everything was BILINGUAL (in French and English), now all the posts are in French. There should be a whole campaign pushing ‘bilingualism' in Haiti. You can't just jump from one language, two languages to a third and to a forth one without mastering any of the primary ones (that are officially recognized in the country's constitution); this is just an advice for schools in general but at home, it would be quite a good idea if parents want to expose their children to more than one, and in Haiti we already know that it's only parents who can who will have the opportunity to do that unless the government thinks of national radio and television programs, putting TVs in the streets so that kids who don't have access to them at home will have a chance to watch some programs for kids and I pretty much doubt it's something that will be done because of its cost, and we may wonder how long it will take the Haitian government to solve the simple electricity problem when Haiti can use Solar Energy (on a 24 hour basis) which would be quite cheap and also advantageous to the whole country. Until then, let's keep on living in ILLUSION (in terms of dreaming of a better Haiti) but do share your great ideas with others.